Our friends over at Pinterest have just released their 100 for 2017, based on the top emerging trends on the site. On a side note, could you imagine what it must be like to get paid to browse Pinterest for an actual living?! As part of their 100, Pinterest have revealed that the oh so popular coffin nail trend won't be the Regina George of nails for much longer. That's because there is a new nail trend in town, one that has been pinned 50% more since summer 2016 and that is chrome nails. Yep, RoboCop nails are going to be everywhere next year, so prepare for your Instagram feed to be flooded. Unfortunately, this isn't a look you can recreate with traditional nail polish. 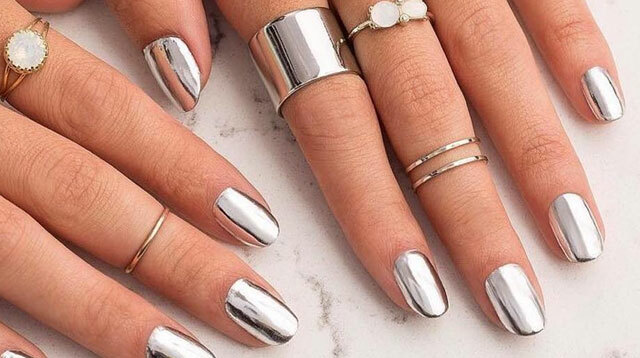 For that mirrored look you will need to go to a nail bar where they use a metallic powder to buff the nails to that intense chrome finish. Alternatively if you're a bit strapped on cash, you can get a similar look with nail wraps. We actually find watching videos on how chrome nails are done, just as addictive as the finished Instagram result.